With humidity today, our “feels like” temperature is 101 degrees. Yep, summer is definitely here in the Midwest! Once summer comes, even drinking hot coffee in the morning feels wrong to me, as I try to stay as cool as possible from morning to night, so of course, iced coffee becomes the order of the day! I actually make it the night before – I throw a k-cup (or two) into my Keurig and brew a cup of coffee, then pop it into the fridge overnight (be sure to use a sturdy plastic or paper cup, not glassware!). Then, in the morning, out it comes to be doctored (for me, a bit of french vanilla creamer), then poured over ice, and voila! Done! The whole process takes about 30 seconds…perfect for those bleary first few minutes of the day! For fun, be sure to experiment with flavored syrups, sugars, creamers, or heck, throw some whipped cream on top! Sometimes, on a snowy Sunday, you just crave some stick-to-your-ribs comfort food. 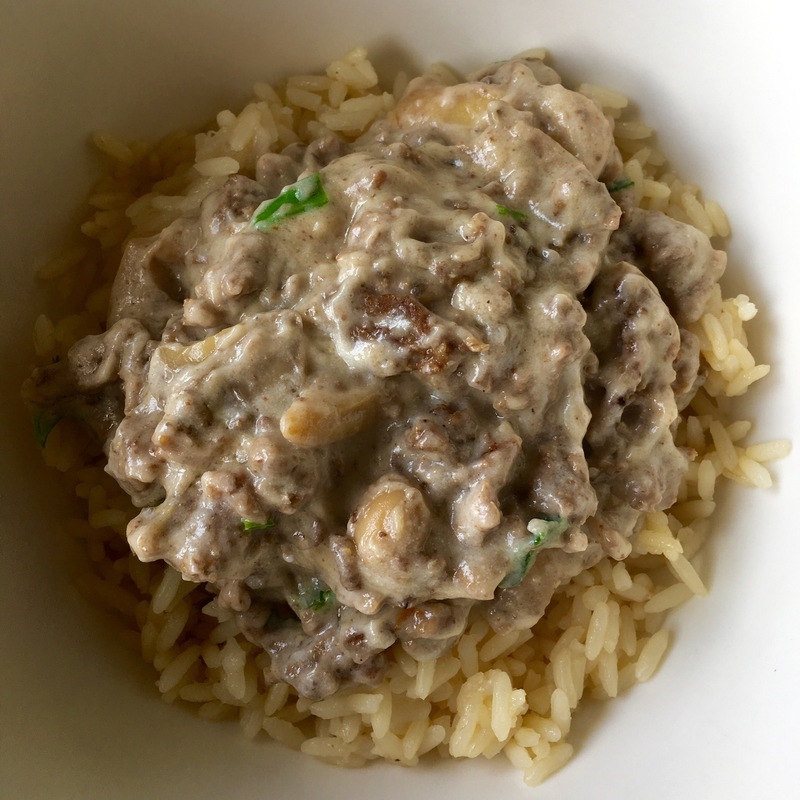 When I think of comfort food, one of the first things that pops into mind is hamburger stroganoff, even though my mother never made it. When I was a kid, my best friend Megan and I were rooting around for an after school snack at her house, and we happened upon leftover hamburger stroganoff on rice in the fridge, made by Megan’s mother Lynn. Even completely cold, it was so delicious and so different from anything I got at my house, and I fell completely in love. As a “grown up”, I do prefer it warm, but I still savor that instant taste memory – and think of that afternoon every time I make this recipe now. So, without further ado, Lynn’s Hamburger Stroganoff! Brown and drain the ground beef (brown with sliced onion and mushrooms, if you desire, but it makes it so much better! ), then add the flour to the beef and incorporate. Next, add the undiluted tin of cream soup and mix well. Season with garlic salt (I toss in garlic powder too, just for fun), salt and pepper, and mix well. Finally, slowly add sour cream until you have the taste and consistency you like best. Garnish with fresh chopped parsley. Divine over simple white rice! I’m a big fan of eggs and bacon, sausage and hash browns, anything that’s yummy protein-y goodness in the morning. And every once in a while, breakfast needs to be a TREAT. A few Sunday mornings ago, I whipped up this rather decadent delight – I hope you enjoy! A few slices of fantastic applewood smoked bacon – go for the good stuff! 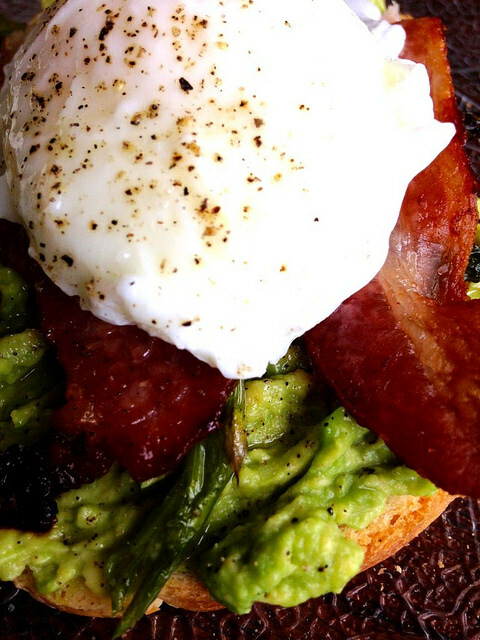 Toast your toast, roast your asparagus and your bacon (400 degrees for 19 minutes is my own oven’s sweet spot for perfect bacon) on the same cookie sheet to save on dishes, mash your avocado while the bacon crisps, and then poach one egg to put right on top. When you break the egg and the golden yolk hits all that delicousness underneath? Bliss. For years, we had a tradition in our family of just having a buffet table of “nibbles” for Christmas Eve. That way, no one was stuck in the kitchen for the festivities, and we could just graze and nibble for the entire evening. It is one of my fondest memories. With the passing of my mother, many of our Christmas traditions has fallen by the wayside, but at least her recipes haven’t – and one of my most often requested “nibbles” was for Scotch Eggs. Now that I have made them, I understand one they were a “special treat” – they can be a bit…laborious. But when you bite into one – whether served warm or cold – oh, but it is good. I made these for Johnna and some friends, and despite their very American palate, they agreed that these were a thumbs up. Hardboil eggs using whatever method you prefer. Be sure to cool then peel them! Deep fry until golden brown, or pan fry while making sure each side is well cooked . Then, bake in the preheated oven for 10 minutes to “finish” them. Note: I’ve been known to just deep fry and leave them at that – they still turn out great, but your breadcrumbs may end up pretty dark. Serve warm or cold – they are divine dipped in mustard. It’s happened to all of us, right? A few folks swing by the house, and being the good host or hostess you are, you want to feed them. Place the cream cheese in a bowl or lipped container and allow to come to room temperature for easier spreading. In a separate bowl or glass, pour your olive oil in, then season liberally with the Italian seasoning. Toss in the minced garlic and whisk all three together. 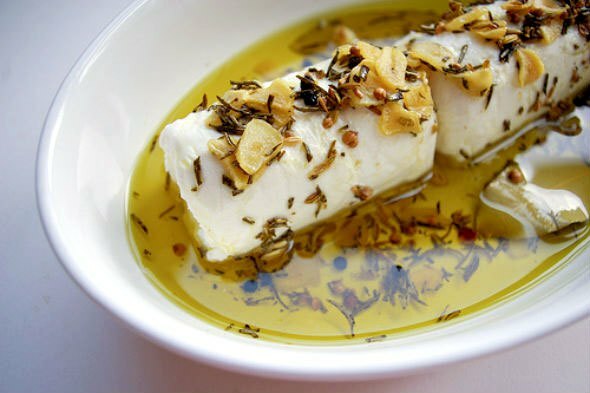 Simply pour the oil over the top of the cream cheese and allow it to hang out in that delicious pool of Mediterranean goodness. Served best with crusty bread, but anything will do! As I’ve previously said, I’m generally not a huge dessert fan, but sometimes…you want something a little sweet. I particularly love it with strawberries, but you could use virtually any in-season fruit – peaches, raspberries or mixed berries would be divine here. Prep your strawberries and macerate them with some sugar – give them a good toss and let them hang out for a while. Preheat your oven to 375 degrees. Grease a baking sheet then lay the pie crust right on the sheet. 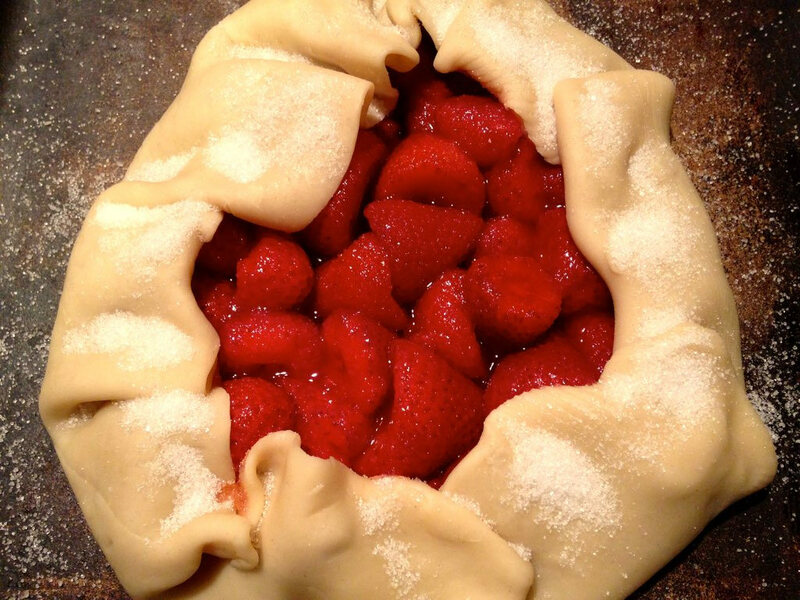 Pile all that strawberry deliciousness right in the middle, then gently pull the pastry up to partially cover the fruit, sealing any holes or rips. Sprinkle a generous handful of sugar on the fruit and pastry then pop in the oven for 25-35 minutes, checking for a golden brown crust. Cut to serve – this is extra delicious with a dollop of whipped cream, or even just some heavy cream poured right over the top. Dig in! It’s true – I’m a soup fiend. I love nothing more than to fire off a pot of soup on a rainy Sunday, to nuke a bowl for lunch in the middle of the week, or to experiment with new recipes on a lazy Saturday. Now that winter has us firmly in her grasp, ’tis the season of heartier soups – at least for me. 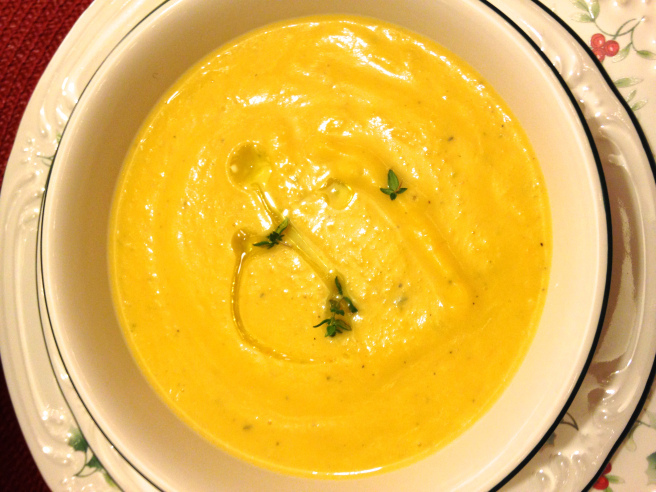 My latest experiment was a roasted butternut squash soup in the slow cooker, and my friends, it was DELICIOUS. Feel free to tweak the recipe to your tastes and to eyeball how much to include – I know I did, taking inspiration from at least three recipes to create this one! Thyme – fresh is better, but dried works in a pinch! Prep your squash and set aside, then toss in a tablespoon or two of butter in a medium heat skillet and cook down your trinity a bit, throwing in the garlic at the last minute so it doesn’t get bitter, and then thyme, so it starts getting all aromatic and tasty. Into the slow cooker put your squash and veggies, then cover with chicken broth, and toss in some salt and pepper and some additional thyme to get things rolling as well. Let this hang out on high for a few hours (like, three) or low for six or seven. I also admit – I can’t leave the slow cooker alone. I’m in there every once in a while, stirring and smelling. Don’t judge me. Once it feels done to you, get your immersion blender out – or in my case, your ACTUAL blender – and blend this puppy down to the consistency you like. Slowly (slooowly) add some heavy cream until it’s the right texture and taste for you. Finish with a little additional seasoning to taste, then serve it up – I like to finish with some extra thyme and drizzle of olive oil. Serve with some crusty bread with the really good butter. You earned it!